While the Green New Deal is drawing both devotees and detractors on Capitol Hill, green energy is seeing nothing but love in the market. Driving the news: The International Energy Agency reports that electricity investment has shifted towards renewables, networks and flexibility, while investments in coal dropped by a third in 2017. It's the second year in a row coal- and gas-fired power generation has seen a pullback. Why it matters: That's got market analysts at UBS betting on renewable energy. 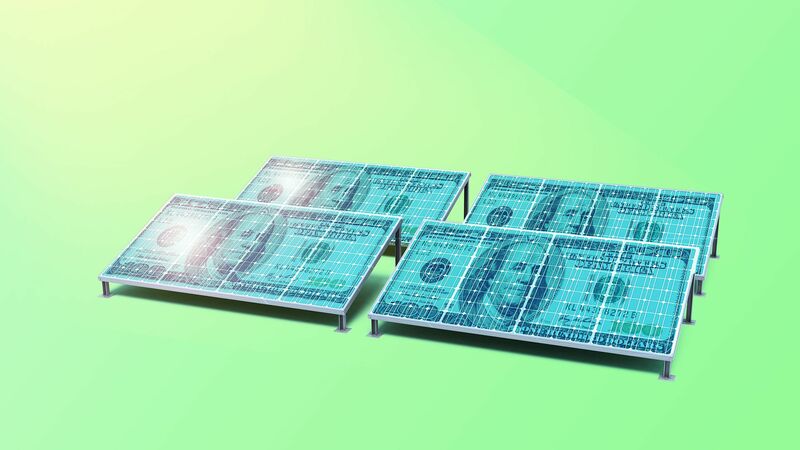 They expect cumulative investment in renewable energy will exceed $9 trillion by 2050 and cumulative investment in clean-air technologies and energy efficiency will rise to $35 trillion between 2015 and 2030. "We think the renewables longer term investment theme has great potential, particularly for project developers and wind turbine manufacturers," UBS analysts said this week in a note to clients. "Clean air, energy efficiency and storage, and electric vehicles are topics closely linked to the theme." What they're saying: UBS points to increasing urbanization and population growth, leading to higher electricity demand; technological progress with relative cost advantages for renewable energies; and an improved regulatory environment of social and political support as tailwinds that will buoy the demand for green energy. As the U.S. retreats from global clean energy leadership, China is stepping up. China is now aiming for renewables to account for at least 35% of energy consumption by 2030. Its previous target was for "non-fossil fuels" to make up 20% of energy use within the same time frame. China just signed a deal with Saudi Arabia's Public Investment Fund on renewable energy cooperation and is further ratcheting up investment in the industry. The U.S. government has pulled back on state resources for renewable energy projects, and Democratic lawmakers are even battling the Trump administration's reported attempts to create a national security advisory panel aimed at countering the science behind global warming. Scientists this week announced evidence of man-made global warming has reached a "gold standard" level of certainty, meaning there is only a one-in-a-million chance the findings are incorrect. Why it matters: China- and Hong Kong-based companies like Xinyi Solar, GCL-Poly Energy and China Everbright International are increasingly rising to the top of alternative energy ETF holdings, which are seeing strong returns in the market, Linda Zhang, CEO of Purview Investments, tells Axios. "When you give good incentives, the market acts," Zhang said. Be smart: China currently has the world's largest installed capacity of hydro, solar and wind power, thanks in large part to government direct investment and subsidies for green energy. While many have expressed worry over campaigns to get asset managers to move away from oil and other fossil fuels through boycotts and divestment, since the beginning of 2019 the industry has faced a far more immediate problem, writes David Sheppard in the Financial Times. What's happening: "Investors, regardless of their environmental view of 'Big Oil,' appear to already be losing faith in an industry roiled by both short and long-term challenges that few are certain how will play out. "The problems range from the prosaic to the existential; lower oil prices brought about by the rise of the US shale industry, which has flipped the supply outlook in many minds from one of scarcity to abundance, has damped the short-term investment case. Longer-term, there are fears about how the industry will fare if, as increasingly forecast, oil demand does peak in the 2030s." "There's just this hate for this commodity right now," Bernstein analyst Bob Bracket told FT in January. "They don't want it in the short-run due to the price swings seen in recent years. And in the long-run there are fears about how these companies look in a decade's time, if the energy transition gathers pace." No one could have predicted that it would take two hours for a member of the Senate to prod Fed Chair Jerome Powell about the Fed's political independence — or that the U.S. deficit would be such a central point of yesterday's hearing, Axios' Courtenay Brown writes. Why it matters: Powell answered a handful of questions about the U.S. debt and then chimed in on the modern monetary theory debate — whether or not deficits matter for countries like the U.S. that print their own money. "The idea that deficits don't matter for countries that can borrow in their own currency I think is just wrong ... U.S. debt is fairly high to the level of GDP — and much more importantly — it's growing faster than GDP, really significantly faster. We are going to have to spend less or raise more revenue." The caveat: Powell called out "unsustainable" federal debt in his opening remarks. But in response to questions from senators, he emphasized that "decisions about spending and controlling spending and paying for it" are up to Congress, not the Fed. What's next: Powell will face the House Financial Services Committee — the first Democratic-controlled body of Congress he's seen since becoming chairman — at 10 am ET. China imported far fewer goods from the U.S. once the first round of tariffs took effect last July and the country retaliated, Courtenay writes. Between the lines: The trade war is to blame for the slowdown, but interestingly imports of U.S. goods that weren't subject to tariffs slowed too when the trade war began. What's happening: According to new research by the International Institute of Finance, this dynamic is proof that non-tariff measures were also contributing to the decline of U.S. exports to China. "[This explains] why the US trade deficit with China grew last year. China's retaliation more than offset the impact of U.S. tariffs," IIF Deputy Chief Economist Sergi Lanau and Head of China Research Gene Ma argue. Early on in the trade war, there were concerns that China would retaliate not with tariffs, but with other tactics — including canceling orders for U.S. goods. Bonus: China is turning to other countries for imports of "animal, vegetable, paper, and mineral products" it used to get from the U.S., Lanau and Ma write. Russia and Brazil are among the countries benefiting most. Data released Tuesday showed U.S. home building starts in December were the lowest since September 2016, and the 11.2% fall from November was the biggest one-month decline since January 2007. But U.S. building permits rose during the month, by 0.3%, meaning a sharp divergence between the number of actual building constructions started and the number of permits filed to build. What they're saying: "The divergence... reflects the December chaos around Federal Reserve interest and balance sheet policies, fearing new tariffs on imported construction materials, declining small business confidence and a federal government shut-down that damped new start enthusiasm," Steven Skancke, chief economic advisor at investment firm Keel Point, and a former Treasury Department official, tells Axios in an email. The housing starts data collection was interrupted by the 35-day shutdown, which Skancke and others say can have a disproportionate negative impact. Plus, U.S. interest rates rose through Q4, the stock market sold off and confidence among homebuilders suffered as did homebuilder stocks based on the NAHB index. It was "the perfect storm," Bank of America Merrill Lynch's Global Research team said in a note. "The good news is that both have rebounded impressively since the start of the year. This sets up for a recovery in starts as builders feel better about their growth prospects." Further, they said, the last time the gap between the two measures was this large was May 2015, "and starts rebounded sharply in the month following." Yes, but: "While we think the data will recover in the near term, it will still leave a further slowing in housing activity," BAML's analysts said. The bottom line: "For a housing sector already assumed on shaky legs, this is alarming," said Jon Hill, interest rates strategist at BMO Capital Markets. History: Alice Augusta Ball was the first woman to graduate from the University of Hawaii, graduating in 1915 with a master's degree in science. She was the first African-American research chemist and the first female chemistry professor in the college's history. At the age of 23, Ball discovered and developed the most effective treatment for leprosy, which at the time was a life-ending disease with no chance of recovery. She was the first person to successfully develop a water-soluble, injectable form of chaulmoogra oil that was used for decades to relieve the symptoms of the disease. Her technique involved isolating ester compounds from the oil and chemically modifying them, resulting in a substance that retained the oil's therapeutic properties and was absorbed by the body when injected. Ball also studied chemistry at the University of Washington, previously earning a bachelor's degree in pharmaceutical chemistry and a second degree in pharmacy 2 years later. The University of Hawaii did not recognize Ball's work for nearly 90 years. In 2000, the university dedicated a plaque to her, and the state's former lieutenant governor declared Feb. 29 "Alice Ball Day," which is celebrated every 4 years.